The eleventh step of Alcoholics Anonymous is “We sought through prayer and meditation to improve our conscious contact with God as we understood Him, praying only for knowledge of His will for us and the power to carry that out” (Substance Abuse and Mental Health Services Administration). While prayer can be an important part of the program for many people, meditation can sometimes be a concept and practice others are more comfortable with and would like to implement more firmly into their personal journey through AA. Through mediation, a person will learn to focus their mind and their attention on the task at hand, whether it is relaxation, openness, or another assignment. You can also find videos where you can be led through a meditative practice or attend meditation classes similar to exercise classes. How Can Meditation Help Someone in AA? 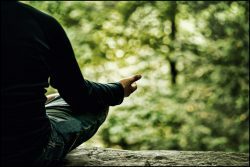 Meditation promotes relaxation and can help you focus on the task at hand. When one mediates as a part of AA practice, they will usually do so on attempting to communicate with their higher power (whatever that may be) and trying to find the answers to their question of how to become a person who is not controlled by alcohol. This act of clearing one’s mind and focusing in on this all-important question can help change an individual’s perspective, allow them to see where they should go next in their recovery, and even allow someone to control issues like cravings for alcohol. In addition, this practice can minimize issues associated with anxiety, depression, stress, insomnia, and physical and emotional symptoms associated with chronic illnesses, something that many people believe alcoholism to be. Just implementing this practice into your daily life can help treat problems that could lead to relapse or are otherwise associated with your alcohol abuse, and it can also help you work through the 12 steps in a way that best supports your recovery. How Do I Make Meditation a Part of My AA Practice? Set aside a time each day to meditate with your intention being listening to your higher power and becoming stronger in your recovery. When you are not focused on this at the time of your mediation, try to focus on whatever else is going on in your day so as not to cause these important issues to overlap. Ask your friends and family to respect your meditation time, as it is important that you can practice in a quiet space. Reward yourself when you have successfully practiced your mediation for a week straight (even if no epiphanies or general changes have occurred for you). Write down what you think about or what you see during your mediation time in a journal in order to keep these thoughts strong and cemented. If you would like to learn more about AA and how mediation can fit into the program, just call 800-839-1686.